Nassau County Legislator Dennis Dunne Sr. recently attended the Seaford Community Blood Drive held at the Seaford High School Gymnasium. The Seaford community prides itself as being one of the largest and most consistent contributors to the New York Blood Center. 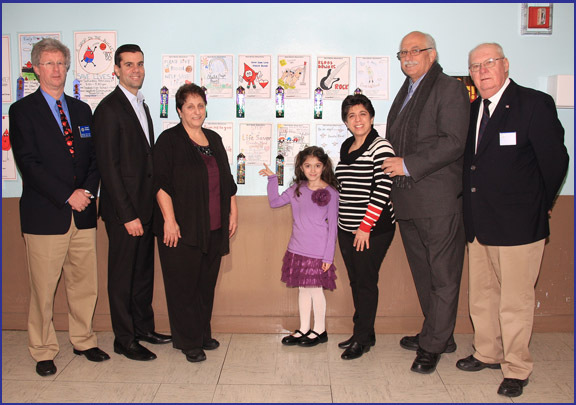 Shown in photo: George Brennan of the Seaford Lions Club, Nassau County Legislator Michael Venditto, Legislator Dunne and Seaford Lions Club President Charles Wroblewski congratulate Community Blood Drive Poster Winner Ava Enea with her mom Renee Enea and grandmother Andrea Hauser.